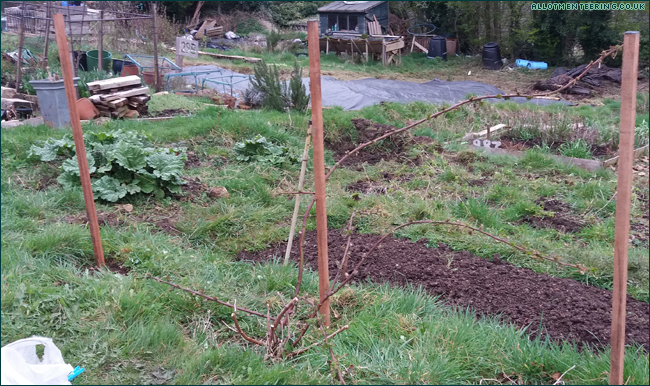 We’ve been talking about getting the Blackberry bush onto some kind of support for ages, and finally found some suitable stakes this week. 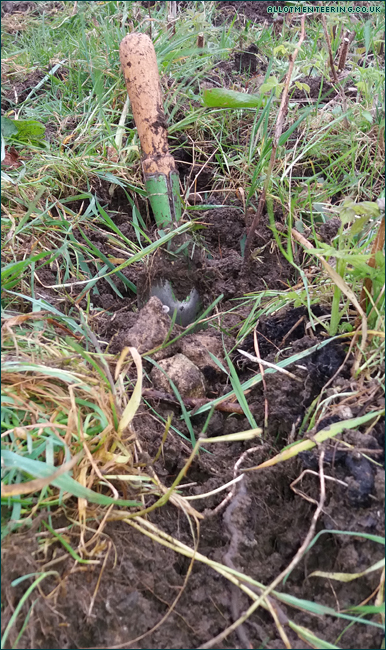 I thought it was going to be challenging to get the stakes in the ground, but it was surprisingly easy – a couple of old socks on the end of the stake padded the top, while a large pebble-like stone worked as a makeshift hammer. All we need now are some suitably short vine eyes to screw into the wood, and we can get the wires attached. Rhubarb! It’s grown a lot in the last week, so this week we brought home the first few pieces – not enough to make a crumble(! 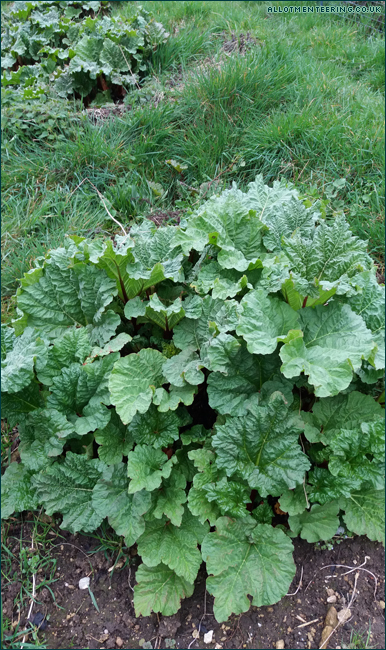 ), in fact it could be described as a “taste” of rhubarb rather than a sensible sized helping, but looking at the plants, I think there’s plenty more to come. We decided it was time to tidy the Raspberry patch before the autumn-fruiting raspberries grow too much. The grass sneaks into the patch every year, making the patch feel more like a jungle at times, but I want to try and keep it more under control this year. 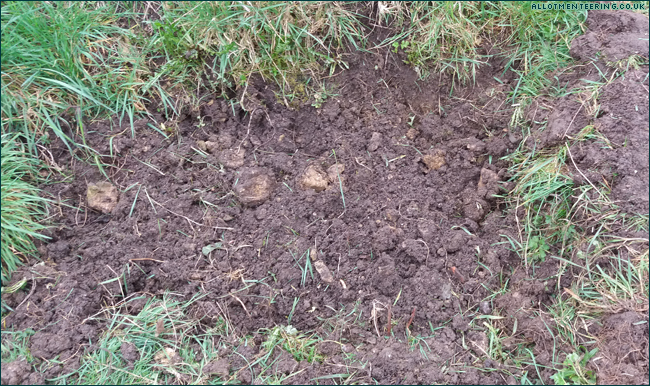 As you can see, it’s not the easiest ground to dig grass out from, but the lumps of grassy soil we removed, have been ‘recycled’ into steps at the side of the plot. There’s still a lot of work to be done before this is grass-free (or at least has a straight edge! ), but I think the soil needs to dry out a bit more before we can get more digging done. Digging out the Cucamelon patch was a bit easier, although there’s a lot of huge stones lurking just under the soil. We’ve not planted anything in this section on a regular basis, and a couple of inches below the surface there’s pure clay…. I think this calls for a load of compost before we can plant anything! Several years ago, I bought this Penstamon and up to now it’s been looking great… unfortunately the green leaves it had last month, have all browned off. I’m guessing it didn’t approve of the cold and snow in March. A relative tells me I should “cut it back”, but didn’t tell me if it’s like Lavender where you don’t cut it back too much, or if it should be cut back as hard as possible. I’m reliably informed by Granny’s Garden that nothing should be cut until the risk of frost is over, and she cuts back to one green leaf on each stalk. Given that I have zero green leaves on the stalks, that might prove challenging, but I’ll give it another week or so just to check the chance of frost, given that the allotment site is so exposed. 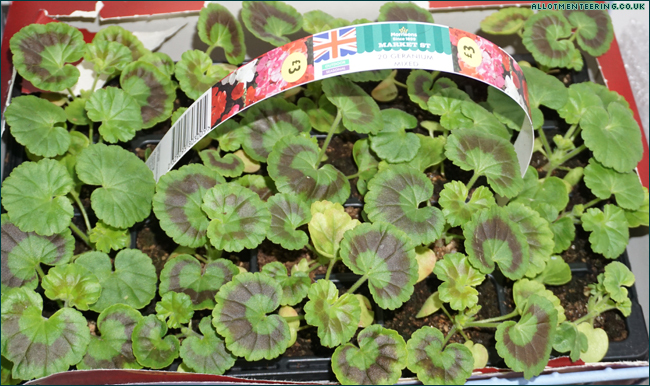 Finally, we have a Morrison’s Supermarket bargain buy… these Geraniums aren’t heading to my allotment, but we’re potting them up to grow on for a relative’s garden. You are already eating your rhubarb! that’s super! I don’t think the ‘chef’ (Mum) was all that impressed with the small amount I brought back for her, but hopefully the taste will make up for the tiny amount! Mmm I can taste the rhubarb crumble already. And you have blackberry and apple crumble to look forward to! We’ve never had enough blackberries to make a crumble from, but hopefully this year we won’t need to add too much apple to it to bulk it out! Those geranium are simply precious. You should sneak one back for yourself. So, does having a cucamelon patch mean you’ve grown them? If so, I was thinking of trying them this year & would love to hear how it went for you. Good luck w/the berry supports! I’ve never tried growing them before – the patch is literally just earmarked for the plants…. assuming they germinate, of course! 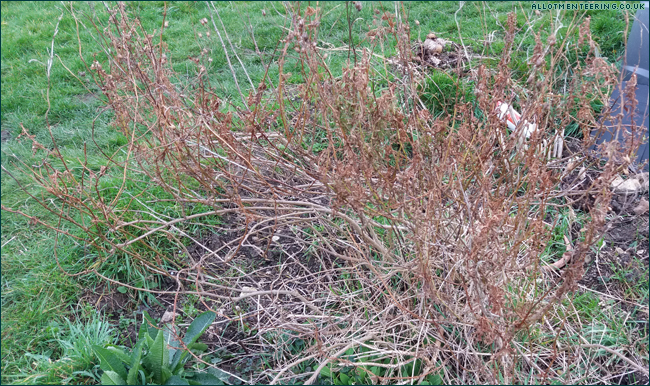 My gaura has gone the same way as your penstemon. Granny, who is wise in these matters, is right, I’ll cut mine back at the end of the month. I’ll try to resist the temptation to cut it back too soon! It’s one of those plants on the allotment that tends to get ignored most years, until it looks desperately in need of attention.